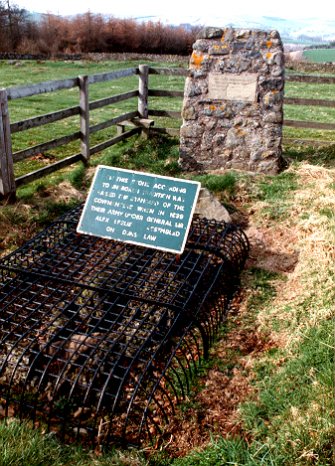 The stone where the Covenanters met had to be protected by an iron grille to prtect it from souvenir hunters. A cairn was added to the site at a later date. The Covenanter army under he command of Genera; Alexander Leslie camped on Duns Law in 1639, following a visit of Charles I's men to publish the king's Newcastle Declaraton. Thus Leslie's men held a strong position, protecting routes north to Edinburgh.